Leading Manufacturer of injectable ampoule filler sealer, two head injectable ampoule filling sealing machine, injectable single head ampoule filling sealing machine, four head injectable ampoule filling sealing machine and ampoule filling sealing machine from Ahmedabad. 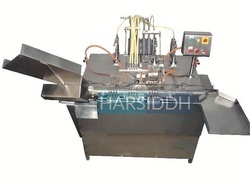 We are engaged in profound business of manufacturing and supplying of Injectable Ampoule Filler Sealer.These machines are fabricated as per the approved industry norms, integrated with advanced working mechanism. Used to cater to the specified filling applications of the pharmaceutical industry, these machines have gained wider market acceptance. We use stainless steel square pipe frame for fabrication of filling unit and thus, assure our customers to have sturdy design. We are leading manufacturing and supplying of all types Two head Injectable ampoule filling sealing machine. 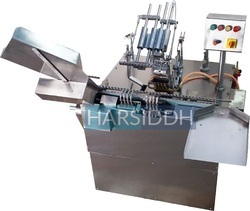 Harsiddh Engineering Co. is manufacturing and supplying of all types injectable Single head ampoule filling sealing machine. Four Head Injectable Ampoule Filling Sealing Machine fills vials with dry powder and seals them with a rubber stopper. Four Head Injectable Ampoule Filling Sealing Machine and rubber sealing machine has high volumetric filling accuracy and enhanced features such as no vial, no filling system to minimize wastage. It also has an inbuilt vibratory stoppering unit for sealing the vials. It comes with a digital counter to determine the production amounts. The automatic operations maximize throughput and uses stainless steel on parts in contact with vials. “No Vial – No Filling” system. Injectable filling with accuracy of ± 1% of uniform density Injectable powder can be ensured by setting the depth of piston in the port of powder wheel. S.S. square pipe frame structure to avoid any vibration with adjustable screws to adjust conveyor height – as per out feed of sterilizing tunnel. To avoid the usage of expensive powder, No Vial – No Filling principle is followed. 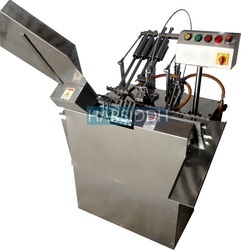 The Ampoule Filling Sealing Machine built on the principle of Slant travel of ampoules while filling and sealing. To take care of wide variation of ampoule neck dimensions, thicknesses, and ovality of available Indian ampoules. 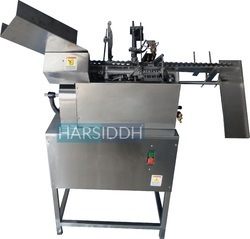 The Ampoule Packing Machine is built on S. S. Square pipe frame and totally encompassed with S. S. Coverings, in the pleasing matt finish, Further, the large opening available at the bottom side for ease of absolute cleaning. The pendant type electrical control panel is lifted form machine for ease of operation and safety. Operation: The sterilized ampoule tray ran be directly loaded in to slant hopper of the unit. The Synchronized star wheel delivers ampoules, one by one on moving eccentric ampoule rack in single or two’s or four’s. During the stoppage of rack sequentially pre-gassing, filling, post gassing, preheating (for single and double head only) and final sealing I annealing is achieved. At the end to the rack, optional synchronized pusher pushes out ampoules in to tray in vertical position. The pendant type electrical control panel is lifted form machine for ease of operation and safety. 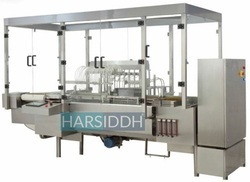 Harsiddh Introducing series of state of art technology Automatic Ampoule Filling Sealing Machines for performance and GMP demanding customers in Pharmaceutical, Biotech, Veterinary, agriculture, chemical and cosmetics industry. The machine built on principal of slant travel of ampoules while filling and sealing to take care of vide variation of neck dimensions, thickness and ovality of available ampoules.The unit built on Stainless Steel Square pipe frame and totally encompassed with S.S. Coverings in pleasing matt finish. Further large opening available at bottom side for absolute cleaning.The pendant type electrical control panel is lifted from the machine for ease of operation and safety. We are leading manufacturer and exporter of Ampoule Filling Sealing Machine and our product is made up of good quality.